The Joy of Giving Week this year will see various volunteering and fundraising events across Bangalore. The innovative initiatives include fundraisers with music from the band Thermal and a Quarter following by dinner prepared five star chefs! Have you decided on what you will do? 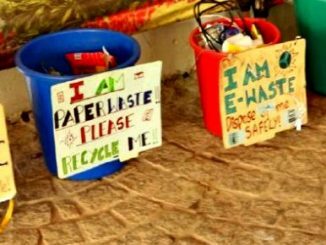 Segregation of garbage at source comes into effect in Bangalore! Here is a guide to ‘Solid Waste Management’ in apartments. Segregation of garbage at source comes into effect in Bangalore! Here is a guide to ‘Solid Waste Management’ in offices. BDA promised action against dumping of debris, but nothing has changed. The residents are running from one department to another to save what is left of the lake. One painting takes months to finish and it also takes a toll on her health. But Prabha Mallesh continues to paint because she believes it keeps one rooted in culture. Justice Santosh Hegde speaks about the Palike’s showdown with R P Sharma and gets candid about whether and how he will endorse candidates in the coming elections. A space for all the rock concerts, consumer shows and political rallies now stands silent. While event organisers have found newer venues, the question – what will become of Palace grounds, still remains unanswered. Reeth Abraham said sports persons should occupy important positions in sports organisations, at a meetup of sports enthusiasts. In scores of schools, religion and scriptures are being taught by the administrations themselves or organisations from outside. Parents, be it from majority or minority community, appear to want this even as intellectuals worry. The common grouse on people’s lips today is – look at those stinking mounds of garbage. What is the BBMP doing about clearing them? But have we stepped back and understood that the garbage on the road is ours and we need to learn to segregate it? South East Asians, and that includes Indians, are genetically much more predisposed to heart disease than other individuals. What can you do to cut down the risks?